By leveraging on project management, design engineering, fabrication facilities, QA and QC; we develop complete mechanical solutions that work together seamlessly. Our innovative engineering concepts and capabilities have enabled us to confront the most difficult challenges in the field and evolved as a strong market force, providing end to end solutions in mechanical fabrication services to our client. The most important asset of TFW is undoubtedly its team - their experience, technical know-how and enthusiasm. We have best of the talents, who have vast experience in engineering projects and committed to provide complete customer satisfaction. Reduced Costs: We have a state-of-the-art knowledge that is completely integrated for compact skid system design and fabrication and thus give you a competitive solution. Tailor-made Solutions: Clients from different industries / domains have different requirements, so every system offered is completely tailor-made. 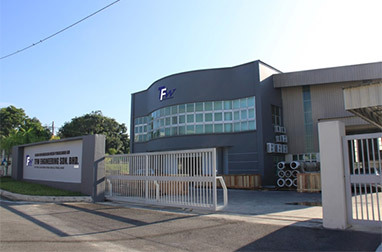 To excel as one of the market leader in water treatment/ oil & gas skid systems design and fabrication, pipe spools and pipe rack fabrication, in order to establish a long lasting relationships with our clients by exceeding their expectations through the company exceptional performance. Quality is evident at every stage of our internal and external customer interactions, in every skid system the company fabricated. The process of quality control is strictly implemented across every stage of fabrication works until the final stage of installation. 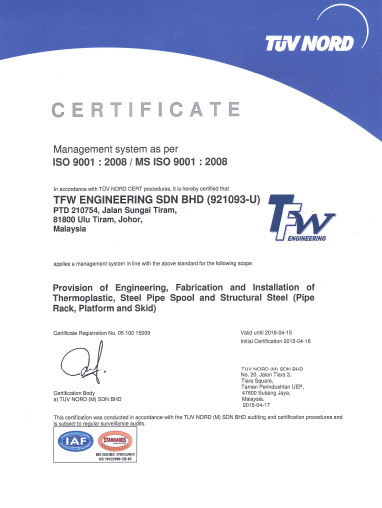 TFW is ISO 9001 : 2008 certified company since 2015-04-16.